We can use the word again when we sum up this game. Again the Lady Terps made it this far, but again they came up short and not making it to the National Championship game on Tuesday. The road block this time was a strong UCONN team, that has continued to dominate teams they have faced this entire tournament. All American Brianna Stewart continues to lead the way for the Huskies. She scored 25 points and along with Tuck’s 24 points, Auriemma’s team sort of made it seem easy. Making the Final Four is almost automatic for the Huskies (37-1) lately as the team has appeared in the last eight national semifinals. UConn had cruised through the NCAA Tournament, but Maryland coach Brenda Frese said her team wouldn’t be intimidated by the Huskies. 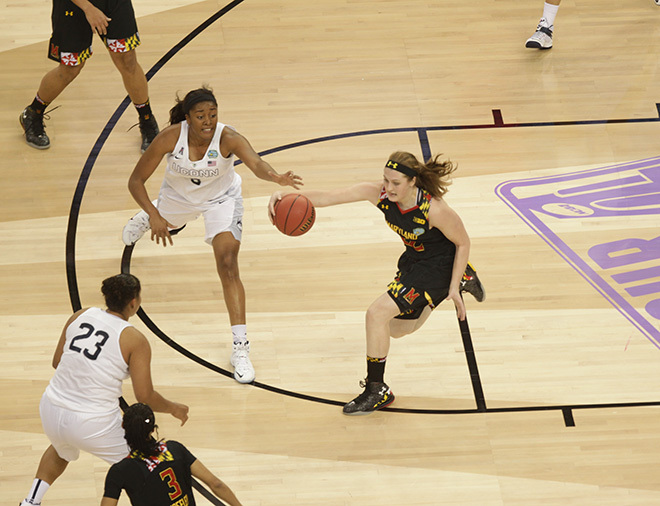 For the Terps, Head Coach Brenda Frese said that her girls played as hard as possible, but struggled to make their shots when they needed to. Maryland hit just 1-of-8 shots to open the second half as UConn opened the second period on an 11-2 run to expand a 44-33 lead to 55-35. Maryland attempted six free throws in the game, becoming the seventh team in Final Four history to attempt six or fewer free throws in a game. It was the fifth time that a team has attempted six or fewer free throws in a national semifinal game.